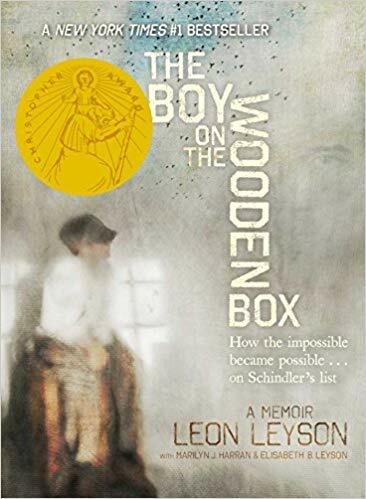 ABOUT THE BOOK (From Amazon.com): "In the #1 New York Times bestseller, Leon Leyson (born Leib Lezjon) was only ten years old when the Nazis invaded Poland and his family was forced to relocate to the Krakow ghetto. This, the only memoir published by a former Schindler’s List child, perfectly captures the innocence of a small boy who goes through the unthinkable. Most notable is the lack of rancor, the lack of venom, and the abundance of dignity in Mr. Leyson’s telling. The Boy on the Wooden Box is a legacy of hope, a memoir unlike anything you’ve ever read." DIRECTIONS FOR OPEN BOOK QUIZ, Ch. 1-3: You may hit "Submit" and then go back and edit your responses up through the due date of Wednesday, 14 November, 2018, at 4:20 p.m. At that point, I'll grade what you've submitted. DIRECTIONS FOR OPEN BOOK QUIZ, Ch. 4-6: You may hit "Submit" and then go back and edit your responses up through the due date of Monday, 26 November, 2018, at 4:20 p.m. At that point, I'll grade what you've submitted. DIRECTIONS FOR OPEN BOOK QUIZ, Ch. 7-9: You may hit "Submit" and then go back and edit your responses up through the due date of Friday, 30 November, 2018, at 4:20 p.m. At that point, I'll grade what you've submitted.